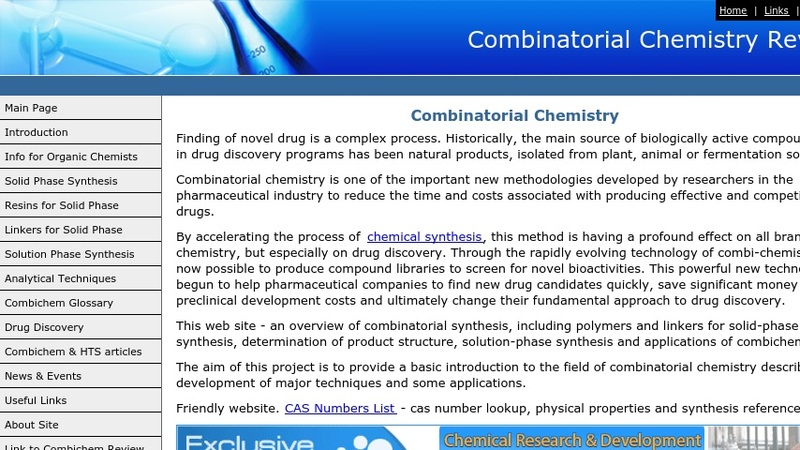 The Combinatorial Chemistry Review website was created by Dr. Oleg Larin at the M. V. Lomonosov Moscow State Academy of Fine Chemical Technology "to provide a basic introduction to the field of combinatorial chemistry describing the development of major techniques and some applications." After reading an introduction discussing the goals, principles, and applications of combinatorial synthesis, users can find more in-depth descriptions and educational figures of the polymers and linkers related to the solid phase combinatorial chemistry. The comprehensive website supplies a discussion of the methods, a helpful glossary of terms, and more.